Documents How do I use a GPIO button to select different audio processing paths? In order to set up multiple audio processing paths and then select them using a GPIO, you can simply use an Index Selectable Multiplexer and a Toggle Counter. In the example below, a GPIO input (ostensibly connected to an external momentary pushbutton) is connected to a toggle counter with a modulus set to 3. The input audio signals are routed through three paths: EQ, compressor, or soft clipper. 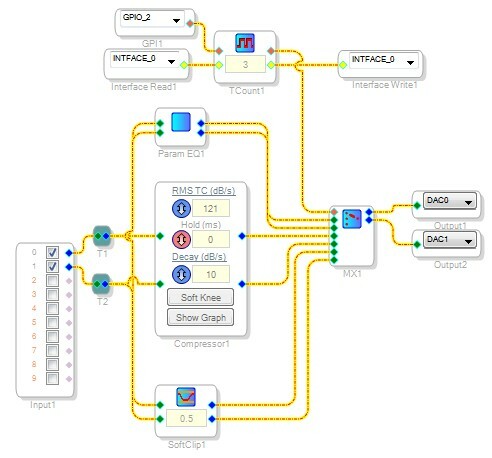 There is an index selectable multiplexer (or alternatively an index selectable slewing mux) that selects one of the three paths to be output to the DACs.